Provide comfort for the family of Geraldine Ray with a meaningful gesture of sympathy. Mrs. Geraldine Ray, age 74, of Swords Creek, Virginia, passed away Friday (March 22, 2019) in a Richlands, Virginia hospital. Born October 24, 1944 in Russell County, Virginia, she was a daughter of the late Roy and Hazel Childress Johnson. A lifelong resident of the area, she was a member of Perkins Chapel. She enjoyed traveling and spending time with her family. In addition to her parents, she was preceded in death by one son, Jeffrey Dean Ray, five brothers, Ernie Johnson, Earl Johnson, Raymond Johnson, Danny Johnson, and Eddie Johnson, and two sisters, Ann Smith and Doris Wallace. Survivors include her husband of fifty-six years, D.E. “Dude” Ray of the home; four children, Terry Ray and wife, Bobbie of Richlands, Michael Ray and wife, Treca of Swords Creek, Jerry Ray of Honaker, and Tammy Street and husband, Roger of Rowe; one brother, Roger Johnson of Tazewell, two sisters, Sue Shortridge and Jeannette Coxton both of Tazewell; nine grandchildren, nine great-grandchildren, one step-great-granddaughter, and several nieces and nephews also survive. The family would like to extend a special thank you to Dr. Javed and his staff for their care over the years. Funeral services will be conducted at 7:00 PM Sunday in the Honaker Funeral Home Chapel, Honaker, Virginia with Rev. Steve Perkins and Rev. Dennis White officiating. Graveside services will be conducted at 2:00 PM Monday at the Ray-Plaster Cemetery in the Call Valley section of Swords Creek, Virginia with Rev. Steve Ray officiating. Those wishing to attend the service are asked to assemble at the cemetery. Honorary pallbearers will be Blake Ray, Luke Street, Corey Ray, Derek Ray, Wayne Ray, Mark Ray, Roger Street, Kevin Delp, Elden Miller, Johnny Coxton, Andrew Robinson, Men of Perkins Chapel, and her brothers-in-law. The family will receive friends at the Honaker Funeral Home after 5:00 PM Sunday. 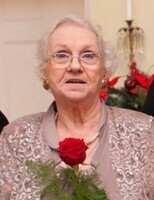 To send flowers in memory of Geraldine Ray (Johnson), please visit our Heartfelt Sympathies Store. Sincerely Nina House and Paul Goyt sent flowers to the family of Geraldine Ray (Johnson). We will miss you aunt. May God best you and your family at this time. God will have another angel! Oh my, Terry I'm so very sorry to hear this. I thought a lot of Geraldine. She was a sweet and loveable lady. Every time I saw her she was always the same. Prayers for you and your family during this though time. Cherish the many memories. Love you my friend. RIP Geraldine. We have fond memories of Geraldine. She visited in our home a few times and I remember her good cooking. We send her family our condolence for I know she will be missed. We will remember you in our prayers. Dearest Ray Family, So sorry for your loss. You're in our thoughts. Wishing you strength during this difficult time. Sincerely Nina House and Paul Goyt purchased flowers for the family of Geraldine Ray.